Precession is an effect angular momentum has on a rotating object. It's pretty neat stuff because its consequences seem so strange. It's why tops appear to wobble and boomerangs come back. A lot of people bring up precession when discussing seasons. This is because the earth is rotating, so it too experiences precession. However, this is not the cause for seasons but a consequence of the cause--tilt. 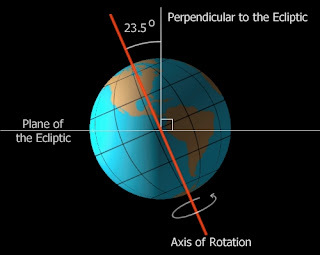 Because the earth is tilted, the length of the day changes as the earth goes around the sun. The length of the day changes the amount of light the earth gets; the amount of light the earth gets affects temperature, an effect we call seasons. The connection between light absorption and temperature is really important but doesn't get much emphasis. To understand global warming, you first have to grasp this concept. Yet for some reason, precession, an obscure fact related to angular momentum, gets thrown in while explaining seasons. Sure, it's a consequence of tilt, which is the cause for seasons, but it just confuses someone who is trying to grasp the concept that the earth is sideways. Then, on top of it, people try to use tops as a metaphor to explain precession. Tops precess at about 1 Hz, unlike Earth, which precesses at 8.11012998 × 10^-11 Hz. So then people get confused because you just told them the earth is sideways and then tossed in counter-intuitive facts about angular momentum with a confusing metaphor to explain them. Just skip precession. You can cover it when you discuss momentum. If you're not discussing angular momentum, it's not important. Aw man, my prof must have read this post.. she never even mentioned precession in mechanics this year. well, in a 300 level mechanics class, it's time to mention it. if you're in 100/200 level, though, you should probably just skip it.